For a tasty, sweet, and large peach, Santa Barbara is a popular choice. What makes this variety unique is not just the high quality of the fruit, but the fact that it has a low chill requirement. It is a great option for gardeners in areas with a mild winter, like California. Santa Barbara peach trees are a fairly new development in fruit growing. The peaches were first discovered as a sport growing on a Ventura peach tree in southern California. A sport is a branch with fruit that is different from the rest of the fruit on the tree. Researchers soon discovered that the new sport was similar to the Elberta variety, a peach known for its high quality, very sweet flavor and good texture. But how it differed from Elberta was in its low chill requirement. These trees need only 200 to 300 chill hours, while Elberta requires 400 to 500. The new sport was soon named Santa Barbara and was introduced to growers in California who were ready for such a tasty fruit that could actually be grown in their climate. The peaches are large with yellow flesh. They are freestone and have a high sugar content. Santa Barbara peaches are best eaten fresh and won’t last long off the tree, but they can be canned. Santa Barbara peach care is much like that for any other peach tree. If you give it the right environment and conditions, it will thrive and produce a big harvest. Put your tree in a spot with full sunlight and soil that drains and won’t leave it in standing water. Make sure it has space to grow to 15 or 25 feet (4.5 to 7.5 m.) tall. Water your Santa Barbara peach tree regularly in the first season and after that only as needed. Use fertilizer once or twice a year, but also amend your soil with compost before planting if it’s weak. You do not have to get a second variety of peach tree to pollinate it, as this tree is self-fertile. Prune the peach tree each year in late winter or early spring to maintain your tree’s shape and health. 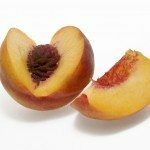 Be ready to harvest your peaches in mid-summer.